This sliding door stands apart by its rigid frame, made entirely of insulating multi-cavity PVC or hybrid, making it exceptionally sturdy and energy efficient. This sliding door system was designed to offer the best option on the market. 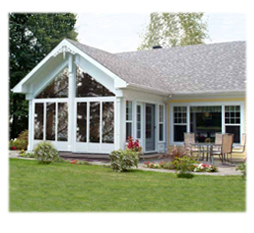 With its elegantly streamlined colonial-style sashes, it matches all Fenplast product lines. Its airtightness is guaranteed with its continuous double weatherstripping around the perimeter and strong interlock that are also fitted with double weatherstripping, providing it with unique performance. It can come with triple glazing for unparalleled energy efficiency. The sliding door in the photo is shown with the Élégante©kit and the EvoPatio© panel. Available in two or three panel versions. 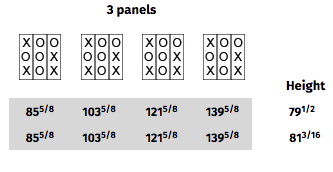 See table below for standard dimensions. Stylized handle with double mortise lock made of a single piece of aluminum, providing durability and security. Its contemporary and fine profile reduces interference between the outside screen, and inside curtains and blinds, and allow for easy opening of the sliding panel. The double mortise ensures greater security than a single mortise or other type of surface lock. This system, with its double opposing hooks, makes it virtually impossible to lift the panel from the outside. The tandem nylon roller wheel system provides smooth, self-lubricated radial movement on the rail. Its treated metal casing is wear and corrosion resistant. The wheel height can easily be adjusted at the ends. It has a robust painted steel frame and moves easily on its adjustable nylon wheels. You can enhance your CaloPatio© door with decorative, security and even energy (by using triple glazing) options. You can also add a side panel or transom with the CaloFixe© frame. 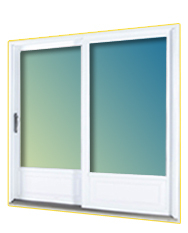 We can make custom size sliding door, according to your specific needs. One of the restrictions, a maximum width of 12 feet. 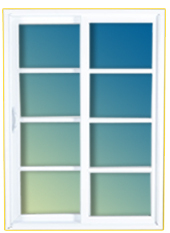 Novo Windows and Doors is a buisness specialized in sales and installation of fenestration product. We are serving Vaudreuil-Dorion, Pointe-Claire, Pierrefonds, Beaconsfield, Ile Bizard, Dorval,Dollard-des-Ormeaux, Kirkland, Roxboro, Saint-Laurent, Lachine, Dorval, Verdun, Senneville, Baie d'Urfé and l'Ile-Perrot .